I have just opened a new review site named Gareth's Review Depot. It will have reviews of JK SP/MP levels and mods. It will also award authors that have the best desgins every so often and will put together periodic level and mod packs. You can join the staff at the site if you want. We don't have any reviews yet but I plan on some in the next week. 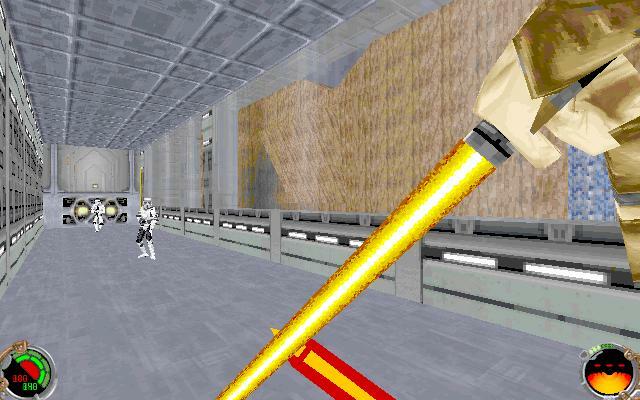 LoQtUS sent in an update to his MP level The Sith Temple (posted 12/02/99), one that properly modifies the start-up COG and allows the players to start as something other than uninitiated. The update replaces the current file. As you can see, the Level of the Week has been updated. Thanks to Slug for that. You can expect the LOTW to be updated every Saturday. Remember, if you want your level to be considered for Level of the Week, just send it in like normal. We choose the levels of the week from our levels archive. 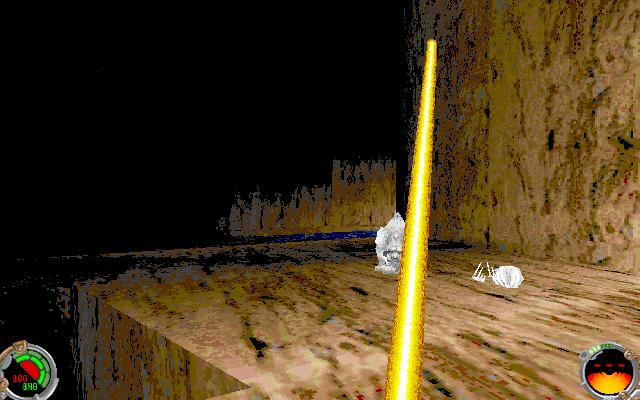 Description: A REALLY small sabers-only level, thrown together in about a half-hour. It has one large arena with some health and force pick-ups, connected to a room with a med droid. Got this from Slade, of the JK Beta Testing Group.. This is Slade from the JK Beta Testing Group. I would just like to tell everyone that testing has restarted. Your level should be on Current Projects page, if not then I don't have it if you have sent it while we were down. This may be old news to most of you, but starting today LucasFilm is re-releasing The Phantom Menace for a one-week run at selected theatres throughout the country. 100% of the money earned this week will go to numerous charities of the theatres' choosing. Check out the list of cities where movie houses are participating to see if there's one near you. C'mon, you know you want to watch it again, and now it's for a good cause! Description: If you're wondering what happened to the Wolfbrother Skin Pack I, don't. The reason I released this was because the first had some really bad skins in it, so I re-did a few, added some new characters and such. This pack includes 25 skins, based off of the Wheel of Time book series by Robert Jordan. The Admiral's Command Chamber has updated with a new review of the Dark Forces level "Assault: Fortress Dantooine." More reviews, as well as a screenshot contest are in the works, so visit the site to keep up on the new content. Description: I was working toward a level that actualy worked, and it did. This is a multiplayer level that is set on an asteroid. It has six rooms, some of them inhabited by your favorite Star Wars movie characters. Description: There is one anti-gravity room (walk into the little alcove to get back to the floor). Outside, there is a long jump between buildings, this sector is anti-grav, so you can jump across. Following that is a long underwater shaft going to the "subway station." You can jump extra-high in here. I've played it with friends and this room is the most fun! Jedi Nights has just announced that they are now hosting the Jedi Knight Archives. The JK Archives has a ton (like, almost 600) files for download. Spart also sends word that the JN file server has been upgraded, so downloads from there should be easier now. By the way, the new JK Archives URL is: http://jkarchives.jedinights.com/. Fett's list has six new biographies up now. More are always needed so I urge you to send in yours if you haven't already. Hyperview has posted a review of Hoth Rebel Base. The level earned a very respectable 4 and a half stars (out of five). Just for a taste, check out this screenshot they posted. The JK Depot has been updating their art gallery with a bunch of killer images. They're not all JK/Star Wars related, but they're all by people who are active in the JK community. Taalo has a new site up, devoted to his mod, "Stellar Fire". The site's a bit bare right now, but here are some shots for you to chew on.. Description: This is an outdoor arena specifically design for saber and force battles. 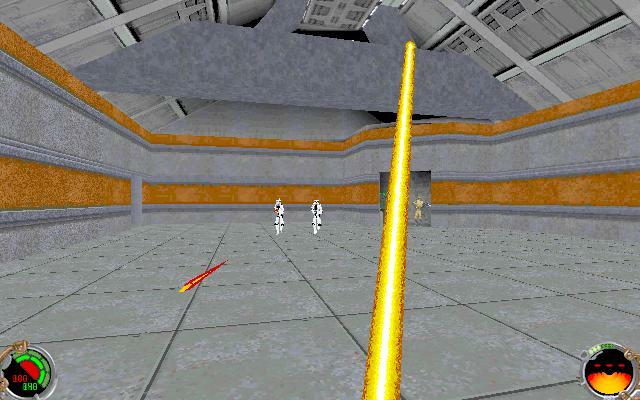 It is impossible to have the dreaded "no force, guns" game in this level because of where the guns are placed. (See readme for explination). All guns are hard to reach and hard to find.... there's a few nice secrets in this level that make it more than just a fighting area... Enjoy, and may the shwartz be with you. Reopen menu items for 3DOs and KEYs. More view options (floor, dynamic camera, background colour). Big thanks to the Code Alliance for their continued support of the JK community. Without further delay, you can download the file by clicking here (270k). I picked up a magazine entitled "Online Arena" which is a production of the editors of PC Gamer. I generally don't read gaming magazines anymore (after all, they get the news months later than it appears online). Anyway, what caught my eye was the level design articles. They discuss the "Top 10 Principles" of level design (nothing new, pretty much everything they say we have had in our tutorials for years, but it's a good read anyway), then go on to teach you how to make an Unreal Tournament level. They also include a CD with a hundred addon levels for various games. It's no surprise that they didn't include any JK or MotS levels, as it's forbidden in the license agreement. JK does, however, garner some awards for best SP level design (falling ship) and best MP weapon (lightsaber). It's sad that they mention JK but leave out the fact that even though they can't distribute the levels on their cd, there is a huge library of addons available. Well, out of 35 applicants, we have 2 new staff members. These were announced earlier, but I would like to personally welcome Takimoto and KoP_blujay to the team. I have mailed out responses to each of the individuals who applied. I really appreciate all the offers, I was overwhelmed by the quality of all the applications - usually it's very easy to choose, but this time I found it very difficult. I still have 3 apps undergoing consideration, so if you haven't received a response yet, chances are we're still considering you. The problem is, I don't want so many staff members that there's nothing for people to do. I will consider the options and respond to those by this weekend. Again, thanks to all that applied. Well, yesterday was my sister's birthday - Heather, I know you don't read this page, but Happy Birthday anyway! Speaking of birthdays, I turned 22 today. I feel exactly the same as I always have. I'm wondering when that age is that you start to feel old... hopefully not until after 40, I have a ton of stuff I want to get done before I start feeling old! Things today will continue as normal, I'm not a big holiday person. Well, I think the screenshot of the day feature has been working out well - a ton of shots have been appearing over on the Showcase forum. I'd like to get some feedback - how many people are enjoying the shots? Please drop a note on the discussion forum in this thread. Description: A skin pack of 21 skins based off of my story, AlieNations, which seemed popular (although not famous) among my peers, so I turned a handful of the characters into skins. Hope you enjoy my second skin pack. DV_DieHappy, author the MotS MP level Die Happy's Maze, sent in an update for the level that, well, let's just say it makes it a lot more playable. The update replaces the current file, which you can check out and download from here. Description: This is a patch that includes modified cog, bm, mat, uni and sound files. The original sabers are replaced by lightning sabers of my own design, and most of the sounds are taken from the game Dark Colony. Description: You are Major Ken Itaro, a special forces agent of the infant Martian Republic. Unbeknowest to you, the Federated United Nations of Terra has just launched a treacherous strike against Martian naval forces in orbit. As you sift through reports in your office the bombardment starts. You - and most other agents, you suspect - recive orders to find a way off planet. The Admiral's Command Chamber has updated with two new reviews and a level feature. In addition to the reviews for "Yug'rin & Zak Part 1" and "Abilities of the Empire" posted today, several other reviews (including a few Dark Forces levels) are in the works. Also visit the new level feature to catch up on story information and screenshots for a new Mysteries of the Sith level entitled "Resurgence of the Empire." A new preview should be posted soon, so be sure to drop by the site so you don't miss out on any of the new content. Last but not least, feel free to explore the message boards and join the discussions taking place there. Hyperview has a new review of TR Council Chamber up. The JK Depot has just opened its newest mailbag! Thanks for all the responses! Our current topic is: "What was your first editing experience and what were some difficulties you faced?" You can send the mail here. We are also looking for staff. We need some guides writers and an image creator. You can send all applications to the following addresses dragonfly@massassi.net and slade@massassi.net. Thanks! Tosche Station has been updated with some new reviews. They have also just passed 3000 hits. This site seems to be a hip and happening place that tells it like it is. One of the reviews included is written by yours truely. The level Jerec's Battleground recieved the worst review yet for this site. For a good laugh, go read it if you have some spare time on your hands. Description: NODBGJ is a remake of the classic BGJ. I have added guns to make it a little more pleasing and added a few other things. It is a fun, low lag level. But when you get high, the only way down is to die! Mehab4 uploaded two new skins to Irrelevant Skins yesterday, one of Gordon Freeman, and the other of Doctor Evil. Check them out, very cool. SavageX uploaded his Jeron Fusion Cutter to his site the other day, so go check it out. CiPHER of Mainframe Editing reports that he has uploaded a screenshot of their Switch skin to their screenshots section. They have two more skins to finish before they have all the skins for their demo pack, which will also have a level from their multiplayer TC. The Mon Calamari Cruiser Sister Liberty (MCC-90) is now officially open. The site is a mix of Star Wars (X-Wing Alliance, X-Wing vs. TIE-Fighter, and Jedi Knight) editing, and RPG. You can submit files and news, or post updates about your current projects on our message board. You can also join the RPG part of the site, which was created to keep the interest in editing XvT, JK, and XWA alive. There are still parts of the RPG that we have not worked out yet, but we will have it up soon. A new site called the JK Think Tank has opened. They take ideas and downloads for cogs, 3dos, levels, and skins so that editors can view them and use them. It's good if you don't want to learn how, or don't have the time to edit in Jed, but have a cool idea that you think could be used. It's also good if you've lost all your creative skills as an editor and want some ideas to get you going. The Wampa's Cave has posted a new review of The Xylian Spaceport. Never thought I'd see the day... Hyperview, a long dead level review site (which was probably the most trafficked JK review site back in the day), has been updating again. I don't know how this slipped by us, but they've posted quite a few new reviews. The JK Centre announced that, The TPM TC has posted two new screenshots. These are actually a couple of days old but I don't think we announced them... [Screenshot 1] [Screenshot 2]. Wow, checking out the TPM TC's page, I noticed that they posted another shot (more recently) - check this bad boy out: [Click Here]. Description: This Patch will replace Kyle with Kai from Lexx The Dark Zone. Kai can flip and kick. Enjoy! Description: This patch will replace Kyle with Greedo from episode 4. Greedo has his own blastech pistol, sounds and can flip. This mod doesn't affect any other rodians in the game! Enjoy! Description: In this zip. file are 5 gobed double sabers. (blue, red, green1, green2, yellow) In Gobed form for ease. Description: These JK skins include Boc, Maw, Gorc, an AtSt, the KellDragon, and a Miolac. It also includes a C2P0, a force&weapon patch that makes you have a flame thrower and a hand held tes le coil and decreases the mana amount lost when the force is used, a Remote, a R2, a R5, a Gran, and a Civilian Women patch created by my sister. (Email KKrunt, Name K Wan Kenobii). The last few was said not to be there in the Readme and were coming soon. Coming Soon: a C3P0, a probot, a sentry, a drugon, a water cyc, a ugnaught, a civilian man, and Pic. Description: This is a medium sized level based off of an office building/apartment, complete with a small hangar bay, a bar, and living quarters, plus more. Tested with a handful of friends, the level has proven to be fast, furious, near lag-less, and fun. A few traps and secrets. NOTE: There are some texture mishaps found IF you use SPORK. Description: This is level pack that has two levels. Both of them are modifications of original Jedi Knight levels. There's also small gift attached. And read both readme -files, thankyu. 1) Gunblade: 3do created by me(sorry, felt the need to toot the horn a bit). The gunblade replaces the fists, so you can still play with the beloved lightsaber. 3) Saber Color toggle: Just a cool extra. Description: This is a single player level from scratch. My 2nd level. 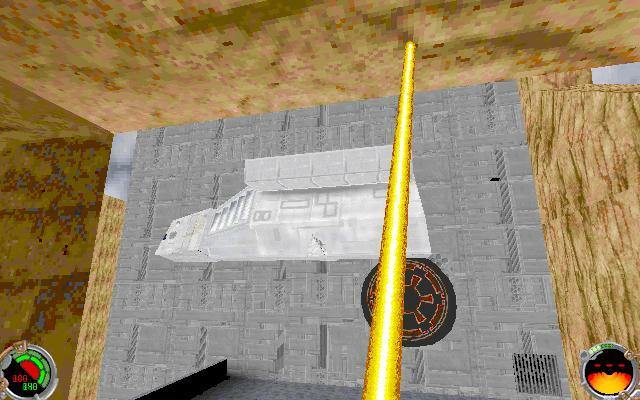 Description: This is a medium size multiplayer level set on an abandoned planet in a mining station. There are many rooms to imitate the feeling of a Mining Station. The minerals found in this level is Iron Oxide (a certain type of rust). This level is intended for 2-4+ players. I believe you should find this level very interesting and fun for gameplay. I have added a forum for the JK Depot (check out hosted sites list and the below art gallery post) to our forum system (http://forums.massassi.net). At this time I have also renamed the JKBTG Forum, so if you have it bookmarked, your bookmark will likely be outdated. All you have to do is visit the forum again through the main forum page and re-bookmark it. Sorry for any inconvenience! I just want to say that the artwork over in the sketches section of JK Depot's new gallery is incredible. I highly suggest you check it out, submit your work, and/or post some feedback on JK Depot's new forum. The JK Depot is proud to announce our newest site feature, the JK Depot Art Gallery! You are all invited to the Grand Opening tonight! We feature work from Jimanatore, who offers up a large amount of beautifully drawn animals; darkjedi, who shows us his talent by submitting his Dark Rider; and I, Dragonfly, who show my drawing talent by offering a character sketch. It is great, and I would like to thank all who submitted art. We will still accept art, just follow guidelines set on the Submit Art page. So sit back, grab a cappuccino and some fine food, and rest your eyes on some awesome art! So far it looks pretty cool, so go check it out. If you check out the top of the page, you will notice two new things. First up is the "Screenshot of the Day" - this will show off the best screenshot that is posted over on our Showcase Forum each day. If you don't have a way to post a screen to the web, feel free to email it to Slug: slug@massassi.net. If you want your shot to be considered for SOTD, make sure to include your name (or nickname), the name of the project, and a short description of the screenshot. Feel free to also include a link to your homepage if you have one. The second feature making it's debut today is the Level of the Week. This will be a place killer levels can get more recognition than the normal post. No special submission instructions are required for the Level of the Week - if your level rocks, it will be considered. This weeks was posted by our very own Takimoto. If you have any feedback on these new features, please let us know by posting over on the forums.